KawaiiPunk - Kawaii Mascot Blog: Awesome Orange! 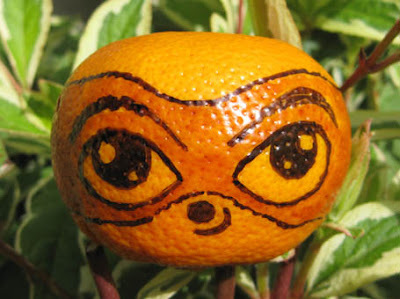 Yes, that’s right, it’s an orange that I’ve coloured in to look like your own good self! And the best part… it took a whole seven minutes to make! That’s seven whole minutes of boredom free bliss! And it’s all thanks to this kawaii blog and its appeal for readers’ art! Although I still have no idea what kawaii actually is! Anyway, hope you enjoy it, and thanks for giving me an artistic excuse to relieve some boredom! Thank you Maximilian! And thanks also for your kind words about our blog, even if you do have no idea what kawaii is! Hmmm… perhaps finding out about kawaii could be another way to relieve your boredom!